Ah summertime…. The time of year when the land is green, lush and verdant, the birds are up early and awake with a song in their hearts, the sky is blue, the sun is shining and the air is full of the happy sounds of people and their pets enjoying the lovely weather… unless you live in a desert. In which case you’ll probably be sheltering from the burning sky, the sun is literally a giant ball of flame and, if you’re really lucky, somehow the climate has also conspired to replace the air with the contents of a superheated steam room (minus the fragrance of eucalyptus). Ok, this may be a bit of an exaggeration but the reality is that we do need to be considerate about the UAE’s climate and certainly adopt a cautious approach during the summer months. From May – October the ambient temperature becomes a challenge (both indoors and outside) and issues such as heatstroke, dehydration and burns can cause injury, debilitation and in some cases serious illness and death. These are facts that unfortunately are evidenced every year and apply to pretty much all species, certainly to ourselves and our furry family members. However, although the climate can seem hostile during those peak summer months, there are a number of ways to reduce the impact and continue to enjoy an active and healthy lifestyle with your pets. A few of these are described below. 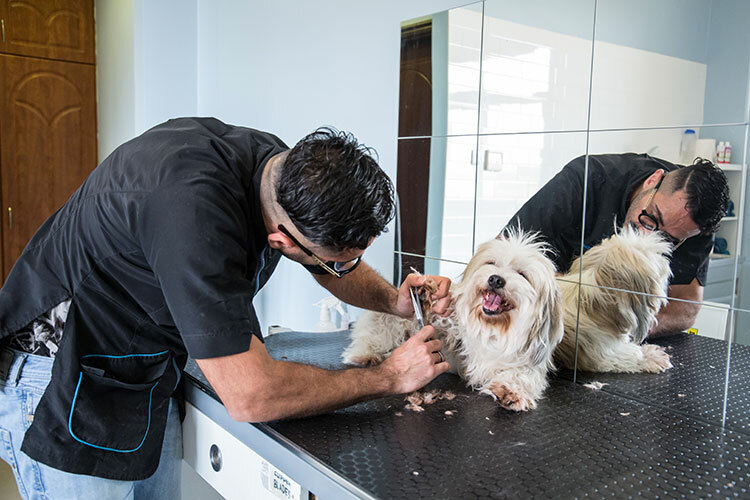 To find out more and devise a specific plan for your pet, we would advise a check-in with the GVC Clinical team. Both cats (certainly the longer haired breeds) and dogs can benefit from a tidy trim or thinning out of their coat during the warmer months and definitely will benefit from regular attention to their paws and pads as these can become impacted by hot surfaces and may need a little extra TLC (read more here). We all love to walk our canine pals and can carry on doing so but just aim to be out and back before sunrise in the morning and after sunset in the evening (to avoid the sun). So very obvious but also so critically important, always have plenty of fresh drinking water available for your pets (and to be extra caring, keep a large pot of fresh water available outside for our avian friends). We can also help keep our pets hydrated through their diet with wet foods that contain higher fluid amounts as well as specially formulated pet broths that are now readily available. However, please speak to your Vet or one of the nursing team before making changes to your pet’s diet. Consider getting a pet water fountain to encourage your pets to drink – cats in particular prefer moving water over still water as they can more easily detect a moving stream with their whiskers. There are a number of hot climate support products available such as dog “booties” designed to protect your pooch’s paws from the scalding pavements and instantly cooling towels, collars, bandanas and blankets that can provide quick relief from heat and sun. Also, sun creams can be very effective for our furry friends, especially sensitive dog noses (ask your Vet for advice). We love it and couldn’t live without it, the same applies to our pets. It is recognized that cats generally have a better tolerance of higher temperatures than dogs (and us), however, having a cool, controlled climate indoors during the day is going to be good for everyone and will help our pets avoid unnecessary heat stress (and worse) when they are at home and we are out and about without them. This is VERY simple, do not leave your pet in a car and especially not with the engine off, even if you think it will only be for a minute or two, dogs especially can overheat very quickly and a car is basically a little green house. This is one of the most tragic occurrences in the summer, entirely avoidable and often fatal (as the damage done can often be irreversible). Perfect, so with a few adjustments and considerations we can all look forward to those balmy summer months, or at least not fear their approach. Of course, there is another option and for all those pet parents who are planning an extended trip away over the summer with their furry families in tow, you can find out everything you need to know about pet travel and relocation by contacting GVC’s fantastic Relocation Team (and learn more by reading our relocation blog). Please do approach the summer months with a plan in place to help keep your pets healthy and happy. Hibernation is probably not an option and all our furry friends benefit from leading an active life, so a couple of months on the sofa is not advisable (no matter how tempting). Therefore respect the climate, plan ahead and be aware of how your pets are dealing with the heat. And if things don’t go to plan and you need advice, support or (hopefully not) medical intervention for your pet, the GVC team are here to help. Call 02 556 2024 or email info@germanvet.ae to learn more.